As a minority rights activist, I understand fully the background and need for a movement like Black Lives Matter. In the US criminal justice system, African Americans are arrested nearly six times as often as their white counterparts. And then the killing of unarmed African American teenager, Michael Brown, by a white police officer on 9 August 2014 in Ferguson, Missouri, shone a spotlight on what the African American community had known all along, namely the disproportionate use of force by American police officers, especially against young African American men. Although nationwide official statistics aren’t readily available, during 2015, according to figures collected by the UK The Guardian newspaper, young African American men between the ages of 15 and 34 faced the highest risk of being killed by police, with a death rate five times higher than for white men of the same age. And what is shocking to me is that these killings continue, now most recently this past week, despite all the media attention. So the minority rights background is clear. In addition, smart phone technology has meant that bystanders (as well as sometimes the victims themselves) have been able to capture what is going on in individual incidents in real time. These video clips have spread via social media, providing literally millions of people with evidence of violations in the blink of an eye. And from this has emerged very clear and repeated documentation that police often fail to de-escalate situations before using deadly force. What has been impressive is how first a national and then an international movement has coalesced around the slogan and #BlackLivesMatter. From the beginning, activists used the internet to challenge the dominant narrative of the protests as ‘riots’. During demonstrations in Baltimore, for example, while some media outlets presented an image of the city being looted and burned, activists were using Twitter to organize street cleaning crews and share first-hand accounts. Another exciting aspect of the movement is how activists have also emphasized that their campaigning extends beyond anti-racism to encompass African American women’s rights, environmental issues and LGBTQ rights. 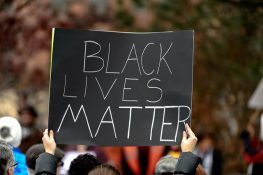 Finally, and more personally, as a human rights campaigner of an earlier generation (I’m 54 years old and have been working in this field for nearly 30 years), I am watching with real excitement as Black Lives Matter continues to grow. We were always told that campaigns, to be effective, needed to be very structured, quite hierarchical, time-bound, with a clear calendar of events and focussed on single issues. What is happening is that social media is injecting a high degree of fluidity and decentralisation. I can only wish the movement every success, and that the public debate it is sparking leads to real changes in the way that US and other law enforcement behaves.